Since returning from our journey through the northwest back in June, we've spent most of our time in the foothills feeling the temperatures rise and summer slowly take hold. I've been fortunate to work up in the mountains guiding other families, but not fortunate enough to wander amongst the peaks and lakes with my own family. The time was ripe to set out on a new adventure, if only for a few days, and experience the alpine world together. 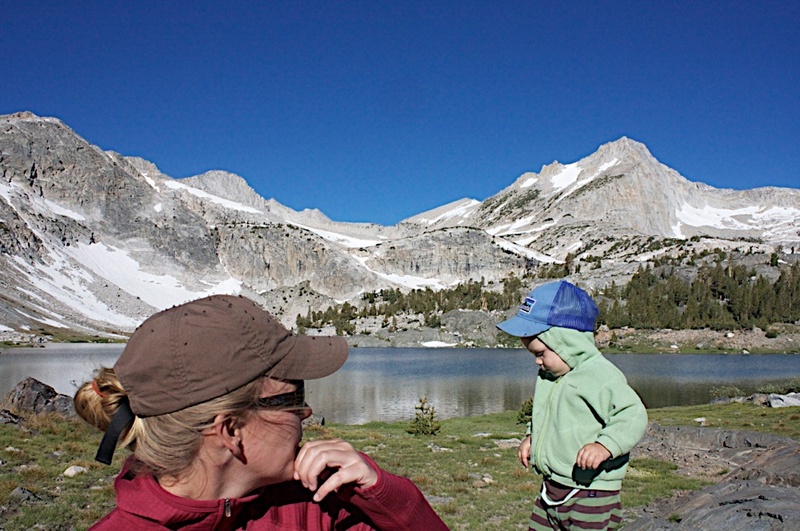 After looking through maps of the Sierra Nevada, we found an area that seemed perfect for the whole family. 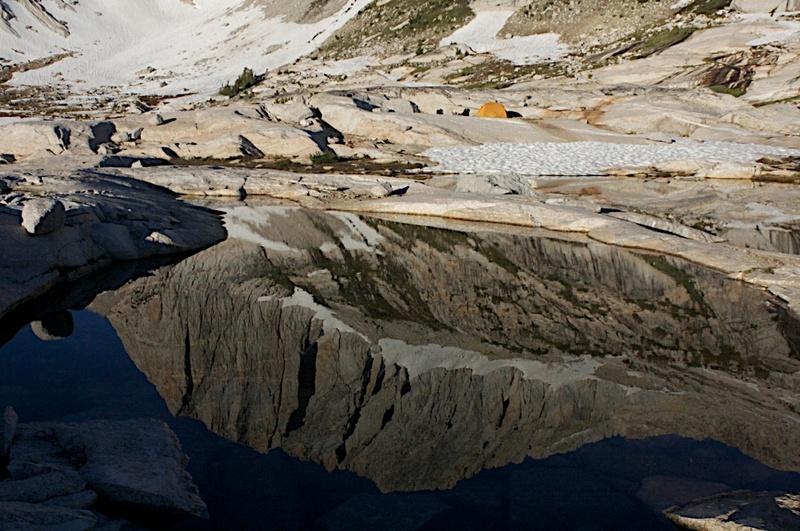 The 20 Lakes Basin in the shadow of Mt. 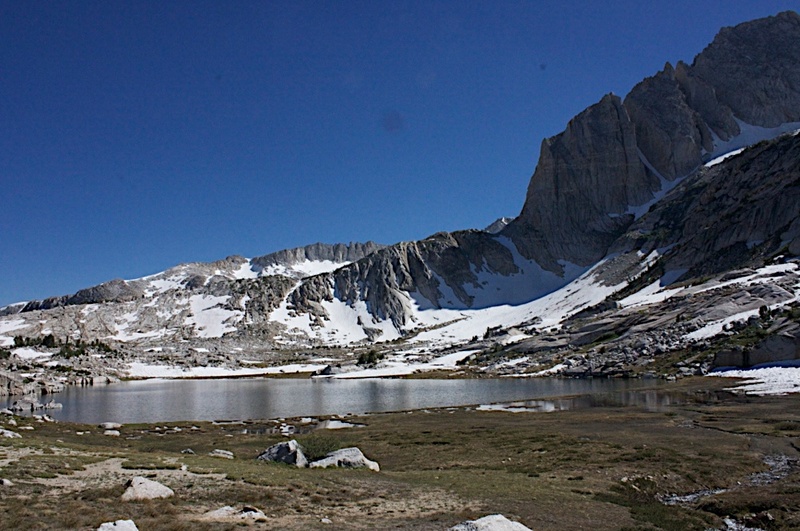 Conness and North Peak stood out as the ideal destination. A basin filled with lakes beneath towering peaks, flat enough for Elias to hike without getting exhausted, for mom to carry Frêney, and for dad to carry everyone's stuff. With a boat ride across Saddlebag Lake we were also able to knock off a couple extra kilometers of the approach. As we rode across the lake in the late afternoon, the mountains rose up around us and we let ourselves be inspired. While we knew we headed into a beautiful place, the spontaneous planning and logistics had kind of taken our minds off of our true intentions. Suddenly we were surrounded by colorful volcanic summits to the east, and stately granite peaks to the west. But as soon as we stepped off the boat, we were met by another force of nature. With the wet and late winter, the mosquitoes have found haven in the valleys amongst the lakes and meadows, and now we were smack dab in the middle of both. We tried to fight them off as best as we could, and held off as long as we could trying to keep focused on the spectacular scenery. We camped next to an alpine lake, just a few hundred meters from where we got off the boat. Deer grazed in a meadow across the creek as the sun set behind granite spires. 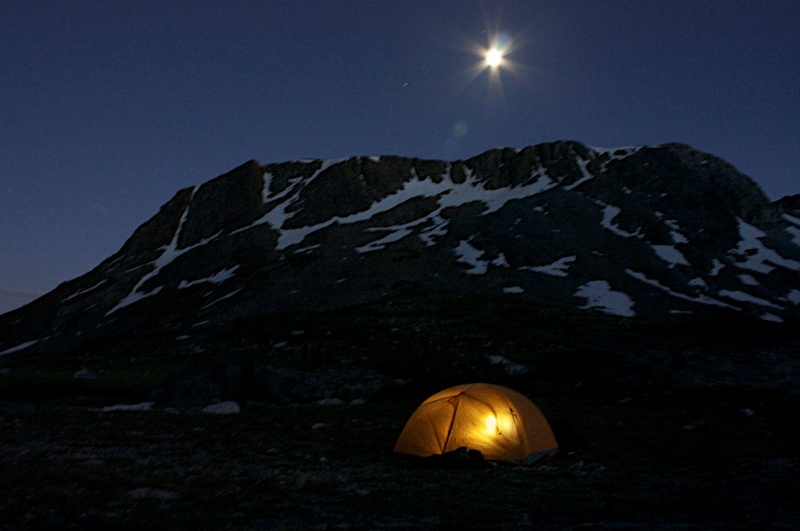 We swatted mosquitoes and went to bed early, finding respite from the constant drone in the confines of our tent. The moonlight and stars illuminating the rock and snow surrounding us. The sun warming our tent woke us. We braved the swarms and quickly ate and packed so that we could head further into the mountains, and hopefully find somewhere less habitable for the mosquitoes. As the scenery became even more alpine we found an area of granite slabs, where the occasional breeze seemed to keep the mosquitoes at bay. Here we set up camp and spent the afternoon swimming in the cool waters and relishing in the landscape. In a natural zen rock garden among scraggly pines and abundant flowers, I bouldered on impeccable granite. Toward the evening, the mosquitoes found us. We did our best to hold off, but eventually they sent us into our tent seeking refuge. I rose early the next morning to revel in the early morning light, alone for a few minutes before the rest of the family also awoke to bask in the glory of the surrounding peaks. Despite the mosquitoes, we reveled in the warming sun. Though with puffy speckled faces, we decided to capitulate. We took a short hike to fill our water bottles in a nearby cascade, before heading back to the ferry and homeward. Inspired, yet somewhat dismayed that we couldn't stay longer. Someday we can hopefully return and again experience these towering granite peaks and pristine alpine lakes.